Before grabbing your next chocolate bar to satiate those intense premenstrual cravings, take a minute to understand where all your PMS symptoms are coming from. Women in their 30s experience intense PMS, with irritability, cramps, mood changes, bloating or headaches, and we tend to ignore these irritations and wait for them to stop, knowing that in a week or two everything will be back to normal. But next month it’s just the same! Stimulate your progesterone production by eating foods high in magnesium, vitamin C and vitamin B6, which are progesterone precursors. Avocado, seeds and nuts, beans and fruits of all kind are great sources of these nutrients. Detox your liver and stimulate digestion by eating foods high in inositol, a vitamin-like compound that boosts your liver function and balances estrogen production (Cruciferous vegetables, such as kale or broccoli, are the richest sources), and soluble fiber to absorb accumulated estrogen and eliminate it via the colon). 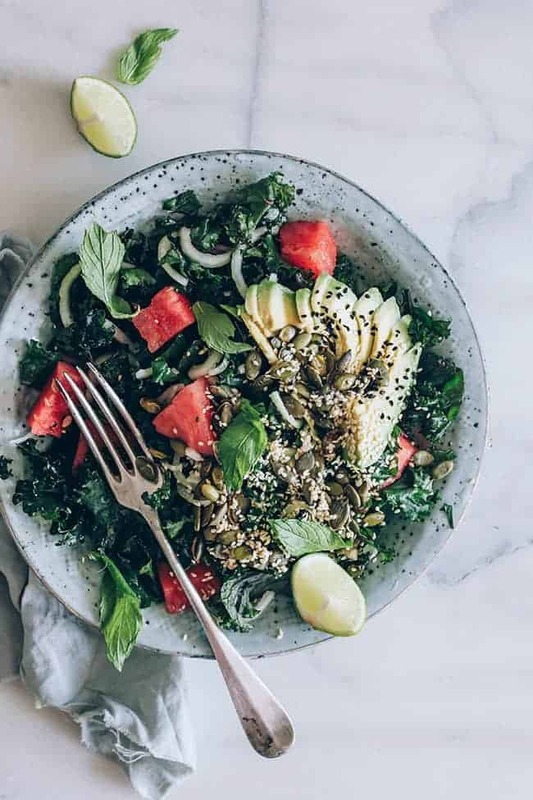 This salad is a perfect way to celebrate watermelon season, while also providing support for your body during the luteal phase. Kale is an exceptional liver stimulant and avocado contains healthy fats and magnesium to increase progesterone production. 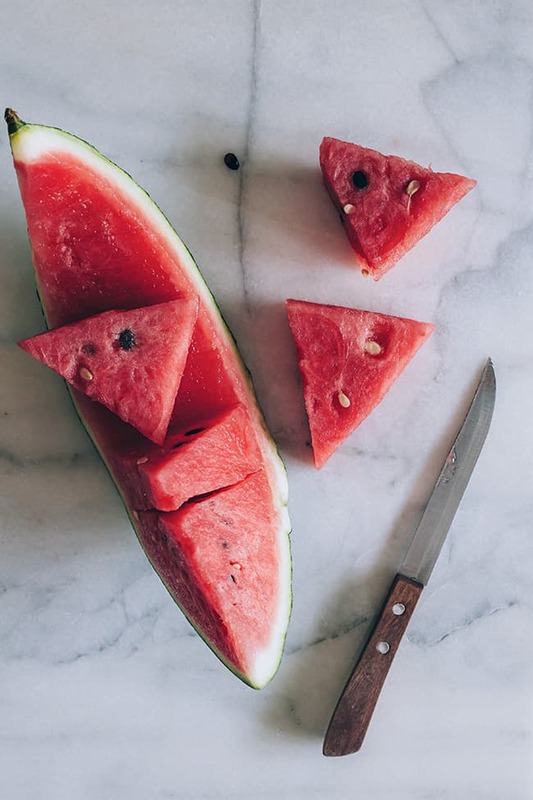 Watermelon is high in antioxidants, especially vitamin C and beta-carotene, helping your liver to break down excess estrogen and offering anti-inflammatory support to your cells before your menstrual cycle. 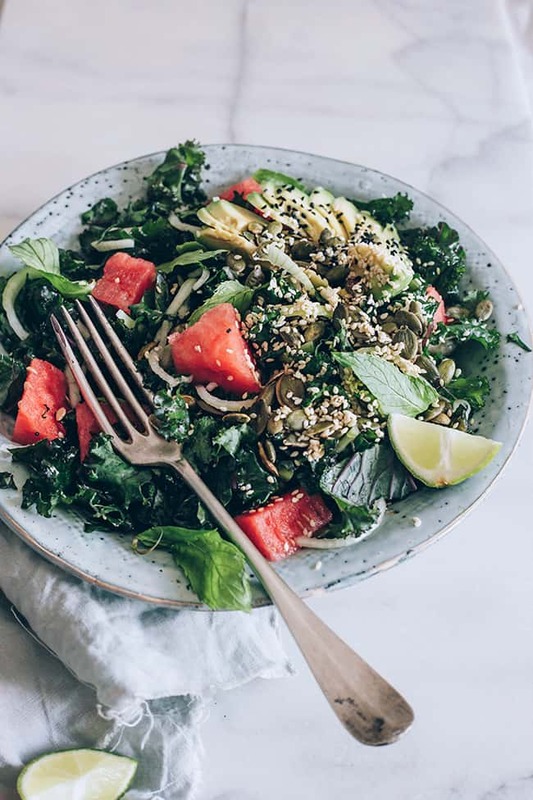 Balance your hormones and ease PMS with this nourishing and detoxifying kale and watermelon salad. Add the chopped kale into a large bowl, drizzle with olive oil and massage it for a few seconds. Add the rest of the ingredients, drizzle with lime juice, season with salt and pepper, toss to combine and serve. Thanks for this recipe and hormonal balance advice. I loved watermelon,i’ll try this recipe! !